What Size Diamond Should I Get? It seems that we have as many differing opinions on this issue as we do clients, and none are right or wrong. Some say “It has to be at least one carat or her sister/girlfriend/mother will think I’m cheap.” Or we’ll hear “she has a really tiny finger so it has to be a very small diamond.” But neither of these approaches is particularly helpful or accurate when looking for an engagement ring. A woman with a larger finger size may actually prefer a smaller stone in a simple setting because of her work or lifestyle. The diamond you purchase, as well as the setting, should be comfortably affordable and possess as many of the quality, style, and practicality factors that are important to you and to your fiancée. For some, that may be carat weight, but for others, it’s the quality of the cut, or how much fire a stone exhibits, or how white the diamond is. 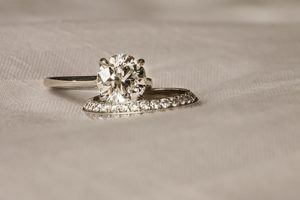 And for many, the “look” of the entire ring is more important than the size of the center stone. And remember – the ring you choose is a personal and individual symbol of your unique relationship, and no one else’s.